The MRC of Argenteuil offers many physical activities at no extra charge. Through a collaborative project between the Municipality of Mille-Isles, the Township of Gore and the Centre d’Entraide d’Argenteuil, it is now possible for Mille-Isles residents to receive food assistance locally, at the Community Center in Gore. This counter makes it possible for Mille-Isles residents to avoid going to Lachute to pick up food. Distribution takes place every second Thursday between 1:45 p.m. and 2:30 p.m. at Trinity hall, 2 Cambria road in Gore. You will need to register at the following number: 450 562-5151 ext. 101. At the time of the distribution, you must have two valid pieces of identification along with proof of residence and proof of income (T4 or welfare cheque). You will not be eligible if you do not provide the requested ID. Please do not forget to bring reusable grocery bags. Through its activities and its service programs and those of its collaborating organizations, the Centre d’action bénévole d’Argenteuil actively participates in the improvement of individual and collective quality of life. Safety of Argenteuil seniors is a project of the “Table de concertation Parole aux aînés d’Argenteuil” in collaboration with similar partners whose principal objective is to improve seniors’ living conditions. This website is a rapid and efficient means to direct seniors, or their advocates, to available organizations and services in the region. Be it for dietary assistance, transportation services, legal information, health questions, or any other concerns, you will find all the resources regrouped into 18 categories, within the section entitled “Service Directory”. For the past eight years, the Coup de pouce Argenteuil solidarity cooperative has distinguished itself by its professional services including domestic help and personal assistance. Those services are now offered to residents of Mille-Isles. Whether for a one-time job in the spring, such as window cleaning, or for regular housekeeping, Coup de pouce Argenteuil meets the needs of the population at a cost that suits the income of the person who uses the cooperative. Personal care is also available such as assistance for bath. In many situations, particularly for seniors who wish to stay in their homes as long as possible, it is important to have the help of someone they can trust to prepare meals, run errands or offer a few hours of respite to caregivers of a loved one. Anyone 18 years of age or older residing in any of the nine municipalities in the RCM is eligible for Coup de pouce Argenteuil services. The fee varies depending on the type of service as well as the age, annual income and marital status of the person. In addition, anyone aged 70 and over is eligible for a tax credit. For a personalized assistance plan, contact Coup de pouce Argenteuil at 450 562-9993. Family Home at the heart of the Argenteuil generations is a non-profit organization whose goal is to welcome families and help them in all facets of their role as a parent. Mission: To provide a resource (meetings, local services, popular education) where people in situations of human, social and economic precariousness, on the territory of the MRC d’Argenteuil, can: socialize, mobilize, organize, learn and interact with each other in order to eat at a low price and take care of themselves for a better quality of life. Hours: Monday to Wednesday, 9 a.m. to noon, and 1 p.m. to 4 p.m.
To consult the information brochure (French only), to participate to the foog buying group (French only) or for information about fruits and vegetables baskets (French only). Did you know that Opération Nez Rouge will be back for the seventh successive year in Argenteuil? Only in 2016, more than 240 persons used the drive home services of Opération Nez Rouge on the territory. Encourage responsible driving behaviors by becoming a volunteer (coordinator, telephone operator or driver). This year, the services will be offered to all residents of Argenteuil on Thursday, Friday and Sundays nights in December, as well as on December 24 and December 31. If you are interested, please contact Jean-Pierre Labelle by phone at 450 327-6311 or by email at onrlachute@gmail.com. The Caisse Desjardins d’Argenteuil supports the installation of birdhouses on the territory of the MRC d’Argenteuil. The offered amount covers 25% of the birdhouse’s cost or 50% if the applicant is a member of a Desjardins caisse. 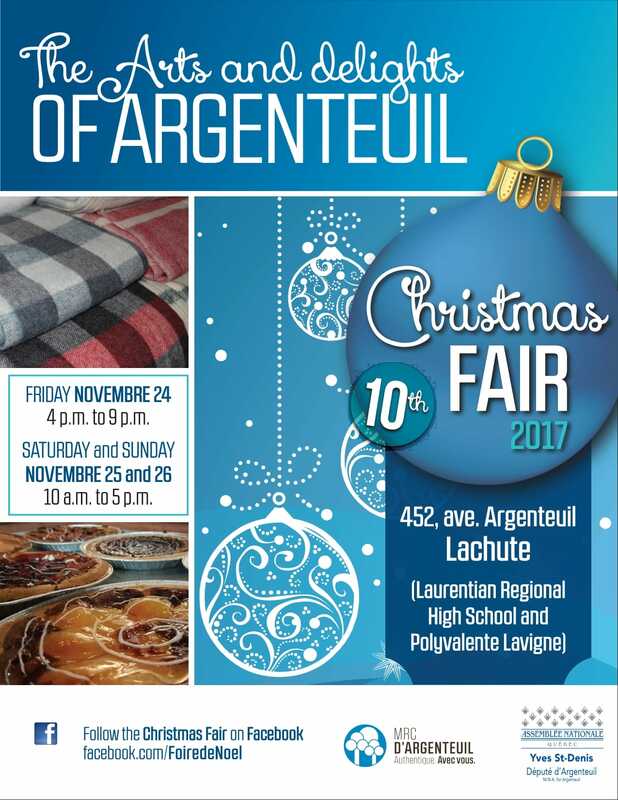 It is with great pleasure that the MRC D’Argenteuil invites the population to the tenth edition of the Christmas fair Saveur et culture d’Argenteuil. When: Friday November 24th, from 4 p.m. to 9 p.m., and Saturday, November 25th and Sunday, November 26th, from 10 a.m. to 5 p.m. The Musical Center brings together participants from all over the world for 7 weeks of musical camp in the Laurentians each summer, as well as offering various stays during the year for everyone and all levels. This building houses the Saint-Andrews Historical and Cultural Area, where several exhibitions, conferences and other activities take place.